It is an honor to continue serving the hardworking people of the 36th Senate District, and I encourage you to contact me about any state issues. You may call toll-free at 1-855-347-8036 or email senjstamas@senate.michigan.gov. Also, please check out my Facebook page. Let me know if I can assist you in any way or if you have an idea to help move our state forward. 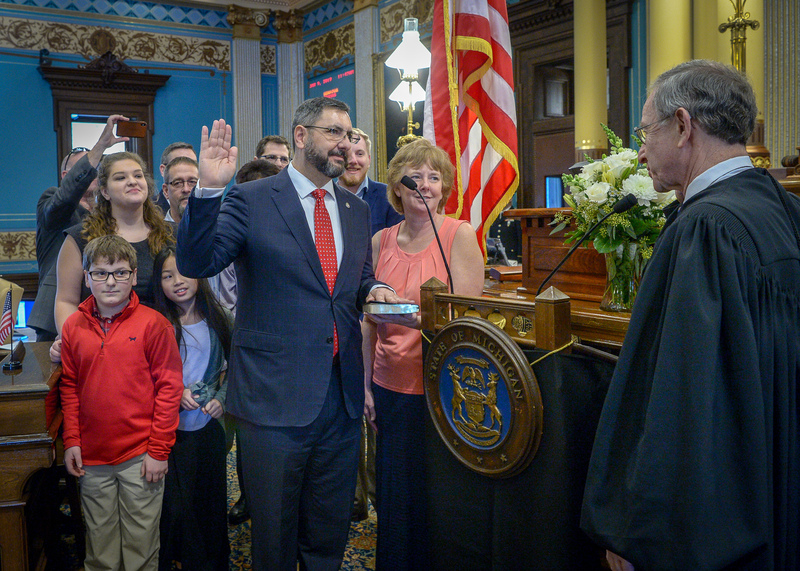 Joined by my wife Marsh, my son Nick, and our extended family, I was recently sworn in for a second term as your state senator. Michigan Supreme Court Chief Justice Stephen J. Markman administered the oath of office during a ceremony at the state Capitol. Although we’ve come a long way, I remain committed to working tirelessly to move Michigan forward, improve education and grow our economy. As we look ahead to a new year of challenges and opportunity, I would like to share a brief look at some important 2018 legislative accomplishments. Please visit www.misenategop.com for more information on these and other legislative efforts. Education is critical to our state’s future, and we further increased support to schools to a record $14.8 billion. Under the 2019 budget, every school will see increased funding in this budget — with most schools receiving the largest per-pupil increase in 17 years! We put an additional $444 million into fixing our roads — bringing our total new investment in roads to $2.6 billion since 2017. After a decade of decline, we built a positive environment for long-term growth. As a result, our final 2018 unemployment rate was at its lowest point since 2000 and Michigan added more than 560,000 private sector jobs in eight years — more than any other Great Lakes State! It’s a positive record, but we can do even better. To keep our communities safe, we invested $11.9 million to train 155 state police troopers and have dedicated $10 million to local public health to address emerging health concerns. We led the way to protect our greatest natural resource — our water — from contaminants such as lead and PFAS. • Ensuring that schools provide emergency contact information to the state police. My top priority remains to provide you with the best service possible. As part of that effort, my excellent staff and I will continue holding regular meetings in the district to hear directly from constituents about state and pocketbook issues. My staff includes Brian Shoaf, Kristen Wall, Scott Starr, Kim Jamieson and Jeremy Rodgers. We also encourage anyone who needs assistance with a state issue or who wants to express their point of view to stop by the office or contact me. Due to my new role as chairman of the Senate Appropriations Committee, my office has moved into the state Capitol, but my contact information is still the same. My office is now located in Room S-324 of the Michigan Capitol, located at 101 N. Capitol Ave. in Lansing. Residents can still contact me toll-free at 1-855-347-8036 or via email at SenJStamas@senate.michigan.gov.